At least when it comes to topical application, you have a choice. You can easily buy fluoride-free toothpaste and mouthwash. But you're stuck with whatever your community puts in the water, and it's very difficult to filter out of your water once it's added. A recently-published Harvard University meta-analysis funded by the National Institutes of Health (NIH) has concluded that children who live in areas with highly fluoridated water have "significantly lower" IQ scores than those who live in low fluoride areas. In conclusion, our results support the possibility of adverse effects of fluoride exposures on children's neurodevelopment. Future research should formally evaluate dose-response relations based on individual-level measures of exposure over time, including more precise prenatal exposure assessment and more extensive standardized measures of neurobehavioral performance, in addition to improving assessment and control of potential confounders. There are so many scientific studies showing the direct, toxic effects of fluoride on your body, it's truly remarkable that it's NOT considered a scientific consensus by now. 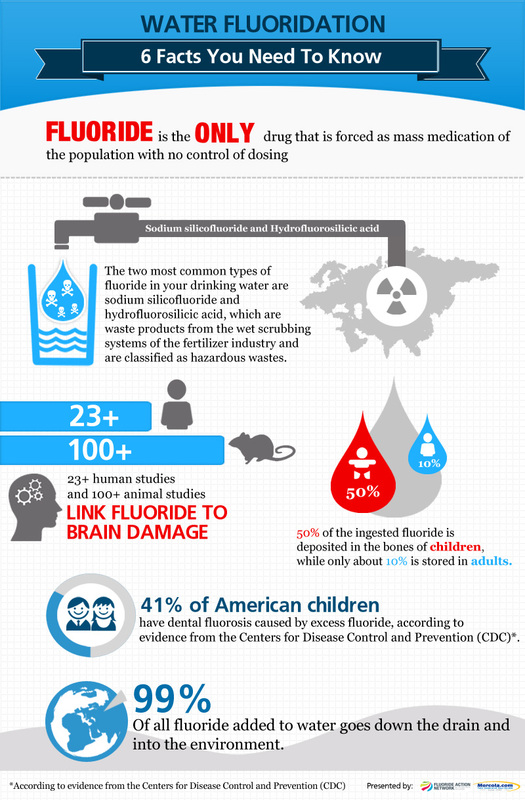 Despite the evidence against it, fluoride is still added to 70 percent of U.S. public drinking water supplies. Fluoride suppresses the immune system: Fluoride inhibits the movement of white blood cells by 70 percent, thereby decreasing their ability to reach their target. Yiamouyiannis cites 15 references in his pamphlet, Lifesavers Guide to Fluoridation, that document immunosuppressive effects of as little as 10 percent of the amount of fluoride used in fluoridated water ... Immunosuppressive effects run the gamut, from a cold that won't go away to increased risk of cancer and other infectious diseases. Long-lost research linking fluoride to cancer has resurfaced in a Dutch film clip featuring Dr. Dean Burk, who in 1937 cofounded the U.S. National Cancer Institute (NCI) and headed its cytochemistry department for more than 30 years. In the taped interview, he equates water fluoridation to "public murder," referring to a study that had been done on the 10 largest U.S. cities with fluoridation compared to the 10 largest without it. The study demonstrated that deaths from cancer abruptly rose in as little as a year or two after fluoridation began. This and other studies linking fluoride to cancer were government-ordered but were quickly buried once fluoride was found to be linked to dramatic increases in cancer.